The role of ticket offices on London Overground is to be reviewed, in a move criticised by the RMT union. Transport for London and Arriva Rail London have announced a series of plans to “review and modernise customer service” on LO. Both have reviewed TfL’s Fit for Future Stations programme from London Underground, to ensure all lessons have been learned from that rollout. A review of the role of the ticket office is being considered on a station-by-station basis, while upgrading ticket machine functionality across the network is being explored in response to the growth of contactless ticketing. ARL plans to meet staff and unions to discuss the plans, and will consult with London TravelWatch. It said there is no need for compulsory redundancies. However, RMT General Secretary Mick Cash said: “RMT is deeply concerned about the proposals, which in our view could see the elimination of ticket offices across London Overground. ARL is considering increasing the number of staff directly employed in permanent roles, and reducing reliance on agencies to cover customer service positions. It said these would be multi-functional, with staff skilled in different areas of customer service. It said all stations would remain staffed at all times that trains are running, and plans to upgrade customer information through technology. The number of staff employed in permanent mobile revenue protection and security roles across the LO network is planned to treble by early 2019. Next year. 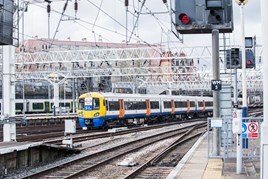 London Overground will be receiving the 4-Car Class 710's Aventra's that will be built at Bombardier train facility in Derby. And they will replace the Class 315's, Class 317's and Class 172's on certain lines that TfL London Overground took over back in May 2015. The RMT oppose everything that alters the status quo. They seem to be incapable of even considering change without threatening to flex their muscles. They have no care for the impact of their actions on either passengers or the integrity of the industry that they work in. It's no surprise that one of the underlying themes of many railway modernisation initiatives is to neutralise their ability to stop the job by going out on strike. Unions have a valid role in any industry but the RMT's actions lie well beyond the bounds of reasonable behaviour. I really feel for the guards on Southern who still go out on strike even though the trains run fine without them. If their arguments about passenger security were genuine, surely they should be at work safeguarding passengers from the myriad of threats that they love reporting on. Their guard campaign now encompasses four TOCs and looks like it will spread to at least one more. They have lost the argument about door control and dispatch but cannot bring themselves to admit it. I feel very sad saying this, but the sooner the TOCs other than Southern with whom they are fighting get their new trains into service and thereby render the RMT's action redundant the better. A couple more years of pain to get rid of one of the biggest obstacles to the industry's development.